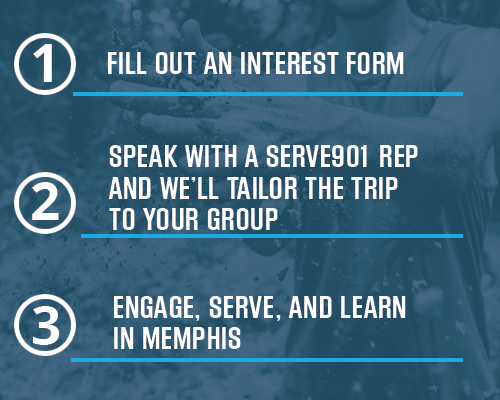 At Serve901, it's our job to guide you through everything Memphis has to teach your group. The story of the Bluff City showcases innovation, hope, and what Memphians call grit and grind. It's Elvis, FedEx, Danny Thomas, Robert Church, the Sanitation Workers Strike, Beale Street, the Yellow Fever epidemic, and Boss Crump. It's certainly not all rosy, but history and wisdom give us the opportunity to improve. A Serve901 trip is also filled with delicious, affordable meals; visits to free music venues; a stay in the beautiful St. George's Bunkhouse, and friendly people who are ready to welcome you here. We believe that Memphis changes people, teaching them to care more about the world around them. Come see us. From Graceland & the Grizzlies to the Zoo & BBQ, Memphis has so much to offer–you won’t be able to do it all in a week. Plan to work hard and play hard during your Serve901 Trip. We partner with local organizations to coordinate service-learning projects. Projects are as varied as our volunteers and the neighborhoods they serve. We can tailor your trip to maximize your group’s strengths and passions. We hope that you not only get your hands dirty and your bellies full, but that you learn and glean from Memphis's story, interaction with locals, and the experiences you have serving.